Far Left Democracy Alliance focused its latest summit on Obama and Holder’s “National Democratic Redistricting Committee” with key NC Progressives in attendance. Watch the millions pour into this ‘committee’. The gathering, hosted by the dark money Democracy Alliance network, is part of the network’s spring investment conference and national donor summit held in D.C to plot resistance against President Trump and Republicans. The summit consists of numerous panels and discussions with key Democratic groups and players. Kelly Ward, the executive director of the Obama-linked National Democratic Redistricting Committee (NDRC) and former executive director of the Democratic Congressional Campaign Committee (DCCC), appeared on a panel Thursday to discuss how progressive groups are “aligning their national plans with one another and in partnership with state donor alliances” for 2021 redistricting efforts. The NDRC is chaired by Eric Holder, Obama’s former attorney general. Obama himself has taken an active role in leading the group. Pay attention to the NDRC. Redistricting or politically orchestrated gerrymandering? – Media Matters & “New Media Ventures” are mentioned multiple times together. – Catalist, the Democrat’s massive data collection system, is mentioned multiple times. – AFL-CIO, AFT, SEIU were all present. – National Democratic Redistricting Committee (NDRC) was a focus. – Newly minted DNC Chair Tom Perez and Democrat mega-donor Tom Steyer were there. – Indivisible Co-Founder Leah Greenberg and Women’s March terrorist Linda Sarsour were speakers. 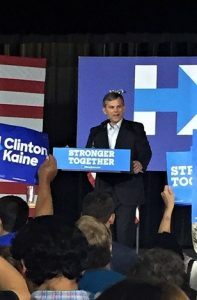 – North Carolina’s Attorney General Josh Stein was called a ‘bright star’ by Democracy Alliance’s Climate Change group, GiveGreen. – Nina Szlosberg-Landis, Put North Carolina First; appointed to 2 boards by Democrat Gov. Roy Cooper; DOT board and Railroad Commission. Below are some of the sessions from the Democracy Alliance summit that have direct ties to key North Carolina Progressives (emphasis added). Participants will learn about state models on the Left that align resources, strategies, and programs to achieve electoral and policy success. WIN Minnesota Executive Director Denise Cardinal will facilitate a conversation among DA Partner and New Mexico Donor Collaborative Chair Jim Gollin, Put North Carolina First Executive Committee Member Nina Szlosberg-Landis, and WIN Minnesota Board Chair Jeff Blodgett to explore the elements of a winning model as well as the grit, determination, and perseverance required to build, fund, and sustain these efforts over time. Participants will be encouraged to ask questions about the role donors can play to drive collaboration among state and national groups, foster aligned planning of data-driven, high-impact engagement and electoral campaigns, and promote a culture of accountability and learning. The conversation will then shift to the audience to hear case studies from donors and practitioners in additional states including Maine, Georgia, Virginia, and Pennsylvania. Josh Stein speaks to the crowd at a Clinton/Kane Campaign Event. Hosted by Anne Bartley and Larry McNeil, Patricia Bauman, Kathleen Welch, Bill Roberts, and Tom Steyer As the Trump administration and their Congressional allies work to dismantle the environmental progress and protections made under President Obama, all eyes have turned to the states””as both our firewall and our pathway forward. While we will go to the mat to defend bedrock environmental laws and recent progress at the federal level, the 2016 election provides lasting lessons on the necessity of investing in down-ballot races and how our issues resonate on the ground. The Democracy Alliance Climate Fund, GiveGreen, and GiveGreen in the States are responding to the urgent need for state level climate action by expanding their programs to build the political power of the climate movement, while working in conjunction with other aligned organizations and efforts. Join one of GiveGreen in the States’ brightest stars North Carolina Attorney General Josh Stein, League of Conservation Voters State Electoral Campaigns Director Leslie Martes, and New Virginia Majority Co-Executive Director Tram Nguyen to hear how states will lead on climate action and defy the destructive denialism in Washington. Even in tough legislative climates, LGBT advocacy organizations have been able to hold the line on previous victories and beat back harmful legislation. Gill Foundation Former President and CEO Tim Sweeney will lead a discussion with Freedom for All Americans Chief Operations Officer Katie Belanger, Equality North Carolina Board Member and transgender activist Candis Cox, and Equality Florida Co-Founder and CEO Nadine Smith that will examine how donor collaboration, state-focused investments, clearly articulated policy goals, message discipline, unlikely allies, and strategic political investment come together to make change under difficult circumstances. The entire life cycle of organizing on issues will be illustrated ”“ from building a constituency, to setting multi-year goals, to plugging into political and legislative cycles in order to win. The importance of investing in leaders who understand where their organization fits into a broader movement and can connect with similar leaders to build a powerful coalition over time will also be discussed. Introduction by DA Board Member Weston Milliken. Planned Parenthood President Cecile Richards will talk about the trends that led us to this moment of crisis and opportunity, spurred by the enormous energy of ordinary people taking grassroots action, to oppose the Trump agenda and how to channel this energy for a change in the nation’s political direction, starting with building back power and winning critical state elections in 2017 and 2018. Repairers of the Breach President Reverend Dr. William Barber will then close with how building progressive power requires building integrated issue advocacy and voter engagement state by state. This article first appeared at American Lens News on March 23, 017. This entry was posted in Am Lens, NC Dems, POLITICS NC, Resistance, Reverend Barber, THE LEFT and tagged Democracy Alliance, Josh Stein, Nina Szlosberg-Landis, Reverend Barber. Bookmark the permalink.